DISBURY J. SLOAN. To have well filled the position of a good citizen in any town, is a record of which a man in either high or low life may feel proud. It is a worthy ambition to place before the young of any community that they should make their aim in this direction and should become enterprising, earnest, public-spirited members of society, always upholding the laws and regulations of the commonwealth and promoting the good of the people among whom they live by every means in their power. A worthy life does this in any event, but it is also worth an effort and an aim. Such a member of the business and social circles of Oconee do we find in the gentleman whose name appears at the head of this paragraph, and whose portrait is shown on the opposite page. Mr. Sloan was born in Knox County, Ohio, April 7, 1829. His parents were Samuel and Katie (Taylor) Sloan, who were natives of Ohio. His grandfather was a soldier in the Revolutionary War and died at Mt. Vernon, Ohio, when ninety-eight years old. Of the parental family Disbury was the first born. Two of his brothers died in infancy and William was killed by lightning while herding cattle on the prairie near Nokomis, Ill. Harriet married Jacob Straub and resided in Montgomery County where she died April 5, 1891; Martha became the wife of John Fritz and resided near Odin, Ill., until her death about twenty years ago, and Mary was the wife of Arthur Brown and died some fifteen years ago at Nokomis. It was in the spring of 1856 that our subject located in Shelby County, and here he has ever since made his home. He engaged in farming, merchandising and stock-raising in which branches he has continued without interruption for forty-four years. He recently turned over his merchandising interests here to his son, though he still owns and operates a large store at Arthur, Ill., where he has $12,000 invested. The store is carried on under the firm name of Sloan & Jones, the junior partner being an adopted son of our subject. 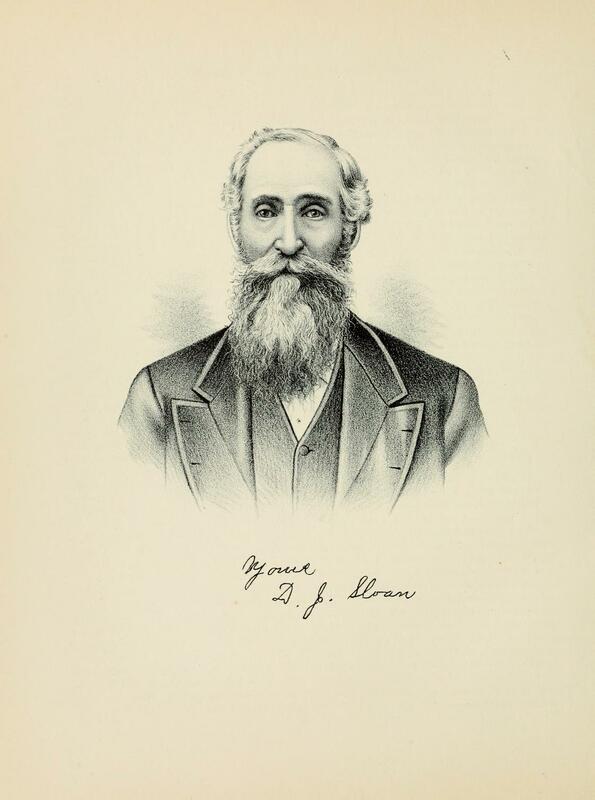 In 1876 Mr. Sloan took a trip to California to recuperate his health, and the following year he went to Wyoming where he embarked in the cattle business. In this he continued engaged in Wyoming and Oregon for four years, then returned to Oconee and resumed his old business, in which he has since been engaged. The marriage of Mr. Sloan at Vandalia, Ill., in the spring of 1852 gave him a wife in the person of Miss Susan Casebeer. Eight children were born to this union and the two eldest (twins) died in infancy; Bosha is married and is carrying on the mercantile business in Oconee; Otis is in the same line of work at Herrick, Ill., and is also married; Alonzo was killed in a railroad disaster and was at the time of his death a merchant; Capitola married B. W. Kerr of Oconee and died in this place several years ago; Docia is engaged in teaching and makes her home with her father. The first marriage was uncongenial and Mr. Sloan procured a divorce from his wife. The second marriage of our subject was with Mrs. Ella Morrison, a daughter of L. L. Gale of Oconee, who was born in Michigan in 1855 and who has had no children. Public affairs deeply interest this gentleman and he has strong faith in the future of the Democratic party with which he is allied. He is regarded as a pre-eminently good and useful citizen of this town and county. He is a worthy member of the Oconee Lodge, No. 392 F. & A. M. of which he was a charter member, although he became a Mason at Pana, Ill. For many years he has been the Lodge Treasurer and still holds that honorable and responsible position. Although he gives liberally to the support of the Gospel, to the Sunday-school and to all public enterprises he is not identified with any church. Extracted 13 Jan 2018 by Norma Hass from 1891 Portrait and Biographical Record of Shelby and Moultrie Counties Illinois, pages 437-440.